TSPS is a cross-platform Toolkit for Sensing People in Spaces. The Toolkit for Sensing People in Spaces (TSPS) is an open-source tool for creating interactive applications based on natural user interaction. 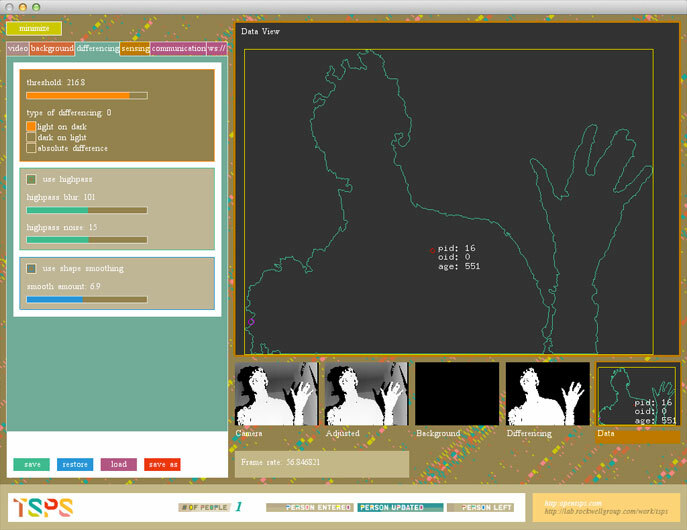 It wraps computer vision algorithms into a simple, easy-to-use interface. TSPS was developed in openFrameworks for use in design, prototyping, and installed systems. We use TSPS for retail, fine arts installations, rapid prototyping, educational workshops, and provide the source openly for use in production. It builds on the backs of giants and our hope is that we can contribute ways to make it easier for beginners to explore computer vision while also providing a framework for experts to build off of. TSPS was started as a collaboration between the LAB at Rockwell Group and the IDEO Labs. It began as an initiative between Dave Vondle (IDEO) and Joshua Walton (LAB at Rockwell Group) with many of the key components generated through the hard work of James Tichenor, Brett Renfer, and James George who in turn also used components from the openframeworks community, who in turn built upon many open source projects. Special thanks to the teams that develop openFrameworks OpenCV, and the many individuals who are all working on creating better computer vision systems.